Disclosure: I was sent this product by MobileZAP.com.au. A couple of months ago, I was sent a Stick-N-Find thingo with the hope that I might review it here on eigenmagic.com. In summary: Don’t bother. It’s an expensive waste of time. It’s a couple battery powered, low-power Bluetooth things the size of two US quarters stuck together. 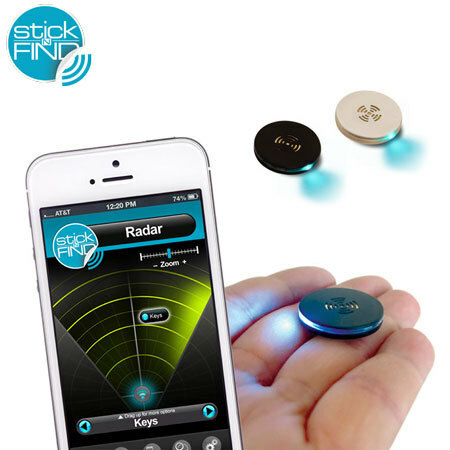 You download the app from the appropriate store for your smartphone, and it’ll pair with the Stick-N-Find widget. It then uses the radio signal power to detect how far away it is. You Stick the widget onto stuff (or the little key-fob things that come with it, and then attach the fob to stuff in a removable way) and then you can Find it by wandering around staring at your phone like some deranged game of Marco-Polo using metal detectors. The alleged range is ‘up-to’ 45m line-of-sight, but unless you’re playing a high-tech game of hide-and-seek on an open football field, it’s more like 20m when the walls of your house get in the way. The app was upgraded from the clearly beta version I first downloaded, and after I installed the new version, it said it had to update the widget I’d previously paired. I presume it needed to download some firmware. What was supposed to take ‘up to’ 3 minutes took about 4 hours. I have no idea why. You can make the widgets beep when they’re in range of your phone, which is probably the most useful part of them. The packaging is reasonably nice, though the manual had printing errors that meant the English version was separated into two different areas. The widgets themselves are a neat little unit that can beep and light up. What with all the work we’ve done with MooresCloud Holiday, I can appreciate the engineering that’s gone into the physical units. The ‘tap to wake up’ feature is fairly nifty also. There must be some sort of switch inside that detects when you bang them on a surface a few times, which puts the device into Bluetooth pairing mode. That’s quite clever. I was hoping to be able to hack on the things and maybe do something useful with them, but my laptop can’t go into Bluetooth sniffer mode, and I’m not going to build a USB-Bluetooth sniffer just to muck about with this thing. All up, I’d be disappointed if I’d actually paid money for them. In fact, I’m disappointed even though I was sent them for free. In hindsight, accepting this product turned out to be a mistake, but one that I’m using to learn from. This was the first offer I’ve received to review stuff on eigenmagic.com. I guess I was flattered, and this little hobby of mine must have reached a certain critical mass of page views after a mere decade or so of blogging. By accepting the product, I left myself open to reciprocation bias, a feeling that I somehow ‘owed’ MobileZap a review, even though I explicitly told them that I could only accept product on the clear understanding that it was entirely my choice to write a review or not. It’s not even a good fit for this blog. I’m not a gadget blogger, and I don’t want to become one. As far as I can tell, this isn’t the sort of thing you come here to read about. In future, I’ll be a lot more careful about if I accept product at all, and if I do, that it’s only stuff you, the reader, are likely to be interested in. From what I’ve read, I’m surprised you got them to work at all!